Tiger’s Eye is a pseudomorph of compact quartz. This popular gemstone is made after Crocidolite, which is a fibrous mineral. We will talk about the stone’s properties, uses, etc. We will also talk about how Tiger’s Eye is formed. Tiger’s Eye is formed from Crocidolite, which is a bluish-gray stone. Crocidolite begins to become a quartz gradually until the transformation eventually ends. This beautiful gemstone gets its unusual name from its unique appearance that has been likened to the eye of a tiger or of other felines. Crocidolite itself is a kind of asbestos mineral, whose composition is made of fibers that are fine and dense. Each of the fibers that compose the crocidolite is placed in a wavy parallel orientation. This specific position creates a unique effect known as chatoyant. In the process whereby the crocidolite becomes quartz, it changes its color from its original bluish gray but sometimes the transformation does not get fully completed. What that happens, the resulting stone still maintains some of its original bluish gray color but often also has some yellow or brown streaks (or overtones). When a stone shows those characteristics, it is referred to as Hawk’s Eye, rather than Tiger’s Eye. What is Tiger’s Eye Matrix? This refers to the material that results when Tiger’s Eye is mixed with Limonite (yellow), or Hematite (metallic gray or brownish red). 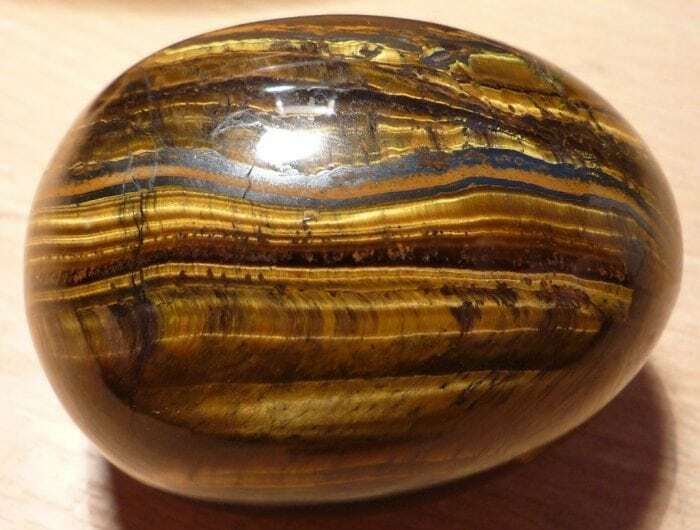 In either case, the resulting stone displays different patterns inside the Tiger’s Eye, including streaks and stripes made of different minerals. A lot of the aesthetic value of Tiger’s Eye is achieved by cutting it in an expert manner, ensuring the best possible chatoyancy. There are several different varieties of Tiger’s Eye, including the following: the Arizona Tiger’s Eye (an Opal pseudomorph after fibrous Serpentine or quartz, which is found in the U.S. state of Arizona); the Blue Tiger’s Eye or Hawk’s Eye (characterized by its bluish-gray color and the lack of brown or yellow, and which is formed by the pseudomorphism of quartz); the Marra Mamba Tiger’s Eye (a strongly chatoyant variety that has a multicolored effect that combines steel blue, reddish brown, yellowish green, and yellow, which is found in Western Australia, at the Hamersley Range); the Tiger Iron or Tiger’s Eye Matrix (Tiger’s Eye with iron oxide patterns or lines, including yellow Limonite and red or dark gray Hematite). 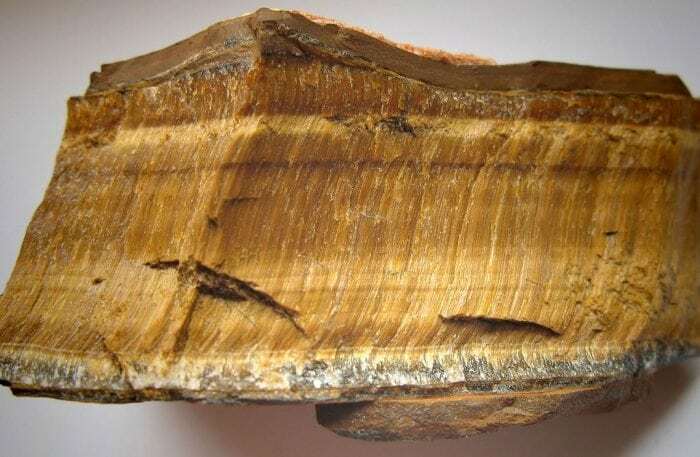 What Are The Properties of Tiger’s Eye? Its chemical formula is SiO2 and its color is yellow, brown, or multicolored. The hardness of Tiger’s Eye is 7 and it belongs to the hexagonal crystal system. This gemstone has a refractive index between 1.54 and 1.55, and an SG between 2.63 and 2.65. Tiger’s Eye has no double refraction whatsoever and an opaque transparency. Its luster is silky, and it has an indiscernible cleavage. This gemstone belongs to the quartz (chalcedony) mineral class. Tiger’s Eye is so unique that, unlike many other gemstones, it cannot be easily confused with other stones. What Are the Uses of Tiger’s Eye? Because Tiger’s Eye is both beautiful and inexpensive it is often used to make jewelry. In particular, this gemstone is used in the making of pendants, necklaces, and bracelets usually in the shape of beads. Tiger’s Eye is also sometimes used in floral pins, ornate carvings, and in costume jewelry. 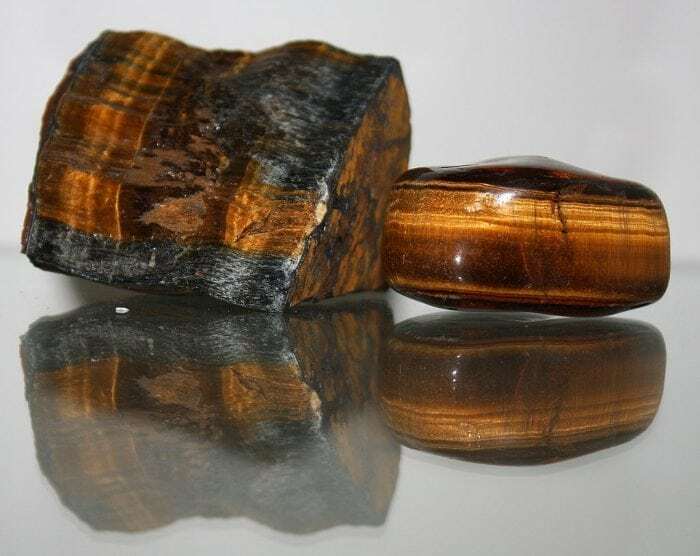 Interestingly, most specimens of Tiger’s Eye are natural and are not treated. The main exception to this would be some Tiger’s Eye specimens that are dyed in order to look red or have maroon tones. Where is Tiger’s Eye found? There are many sources of Tiger’s Eye around the world but the main source is located at the Northern Cape Province in South Africa. 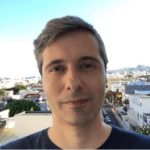 All the other sources are much less important and are located in Australia, in the Asian nations of Thailand and India, or in the African nation of Namibia. The reason why this gemstone is so affordable is that there are so many abundant deposits of it in so many locations around the world. This is a rare case of a gemstone that it is valued for its unique beauty and yet it is widely available at reasonable prices.